Lisa Wilkens calls her works “prevented portraits”, and the title, initially at least, seems apposite. Her lithograph, Prevented Portrait: Myself, is a portrait prevented from doing what portraiture was always designed to do: to show the face. We see the back of a short-haired human head in a curved-edged frame. The levelness of its pose suggests a sitting for a passport photo or head shot, and its suit jacket, smart shirt and neatly combed hair imply another kind of ‘straightness’ – a sense of the conventional, of the straight and narrow. The generic associations of the clothing are carried through in (what we see of ) the head itself; its hidden individuality makes it as interchangeable as any face in the crowd. This, then, is a portrait that swerves away from the specific; a kind of anti-portrait. And yet a turned head – familiar from works by Vermeer or Richter – suggests something else too: absorption. 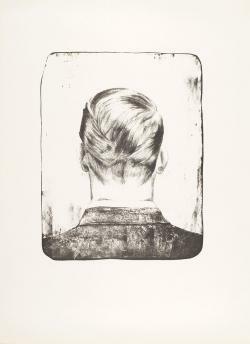 Wilkens’ lithographic process, requiring a steady hand and focused eye, is mimicked in the turned head’s evident attention at something we can’t see; the precision of her description (the feathered strands of hair, with its slick sheen) can’t elucidate the head’s mystery. This is a self-portrait that hides itself in the thickets of its making. I am currently engaged with the theme of portraiture and its limitations and possibilities in contemporary art. Based on historical photographic source material which I find online, I create drawn images on lithographic stones, interpreting what I see on the computer screen. Using old paper I have collected over the years, I take prints from these stones. The portraits I am interested in conform with formal aspects of portraiture (head and shoulder) but contradict the conceptual aspect (facial features are hidden). They are prevented portraits, aiming for ‘the real’ and representing a graphic truth whilst evading the very same, occupying a space between the depcited and myself as their producer. I see my practice as a way for analysis, a method to question the images of ourselves. The deviation between the portrayed and the given title bereaves the image from its comfortable conventions creating an impossibility. The lithographic stones are the mirror which reflect everything simultaneously, the familiar as well as the paradox. The distance between myself as producer and the subject, between the depicted and the observer and between the reproduction and the world is made to disappear by the construction of the work by means of the title which in return leads to a strange emphasis of the very same. Thereby these portraits are less about self-reflexivity but rather aim for a reconsideration of the relationship between the portraits and the perception of ourselves. They are prevented portraits that overcome the distances of time, space and individual, they are portraits that do not portray.